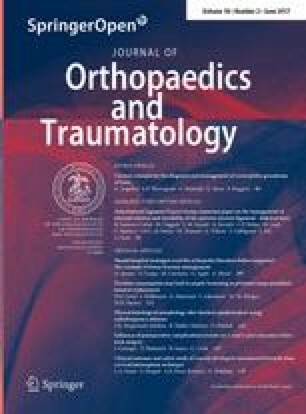 Purpose of this paper is to provide an overview of the latest research on the anterolateral ligament (ALL) and present the consensus of the ALL Expert Group on the anatomy, radiographic landmarks, biomechanics, clinical and radiographic diagnosis, lesion classification, surgical technique and clinical outcomes. A consensus on controversial subjects surrounding the ALL and anterolateral knee instability has been established based on the opinion of experts, the latest publications on the subject and an exchange of experiences during the ALL Experts Meeting (November 2015, Lyon, France). The ALL is found deep to the iliotibial band. The femoral origin is just posterior and proximal to the lateral epicondyle; the tibial attachment is 21.6 mm posterior to Gerdy’s tubercle and 4–10 mm below the tibial joint line. On a lateral radiographic view the femoral origin is located in the postero-inferior quadrant and the tibial attachment is close to the centre of the proximal tibial plateau. Favourable isometry of an ALL reconstruction is seen when the femoral position is proximal and posterior to the lateral epicondyle, with the ALL being tight upon extension and lax upon flexion. The ALL can be visualised on ultrasound, or on T2-weighted coronal MRI scans with proton density fat-suppressed evaluation. The ALL injury is associated with a Segond fracture, and often occurs in conjunction with acute anterior cruciate ligament (ACL) injury. Recognition and repair of the ALL lesions should be considered to improve the control of rotational stability provided by ACL reconstruction. For high-risk patients, a combined ACL and ALL reconstruction improves rotational control and reduces the rate of re-rupture, without increased postoperative complication rates compared to ACL-only reconstruction. In conclusion this paper provides a contemporary consensus on all studied features of the ALL. The findings warrant future research in order to further test these early observations, with the ultimate goal of improving the long-term outcomes of ACL-injured patients. Level of evidence Level V—Expert opinion. After Steven Claes had authored the re-discovery paper about the anterolateral ligament (ALL) of the knee in 2013, this “new” anatomical structure was cast into the spotlight by the lay media . Since this date, orthopaedic surgeons have demonstrated a renewed interest in the anterolateral structures of the knee, with more than 85 articles being published on the anterolateral ligament. Despite this extensive research effort, there is no consensus whether or not the ALL exists and which functions it serves; on the contrary, the ALL is a highly controversial subject. For some authors this anatomical structure either does not exist or has no function in knee stability [38, 44, 60, 76]. For others authors, its existence has been demonstrated macroscopically in all knees, and its histologic appearance has been identified as a ligamentous structure [9, 19, 32, 102]. Furthermore, the ALL appears to be involved in the rotational control of the knee [71, 87]. A very similar controversy concerning the medial patellofemoral ligament (MPFL) plagued the field of knee surgery after publication of the first clinical report on MPFL reconstruction in 1992 . At that time, the existence and the function of the MPFL was heavily debated and challenged by many authors. The controversy was mainly due to the difficulty experienced in isolating the MPFL using different dissection protocols, and in identifying this structure by imaging [including magnetic resonance imaging (MRI)]. Nowadays, discussions around the MPFL mainly focus on the surgical indications for MPFL reconstruction and the surgical technique applied; its clinical role in patellar instability is now widely accepted by the orthopaedic community . Further similarities can be found between the MPFL and the ALL. From an anatomical perspective, it appears that different ALL surgical dissection techniques have led to different rates of identification, as well as varying reports about ALL shape, location and dimension. Biomechanical function has been reported to be different, and different reconstruction techniques have been proposed. This high variability is not surprising if different structures, all being called the ALL, have been investigated . It took many years for MPFL reconstruction to be widely adopted by orthopaedic surgeons. The ALL could be the anatomical missing link justifying the historical “lateral extra articular tenodesis” (e.g. Lemaire and MacIntosh procedures) [46, 52] for rotatory instability in anterior cruciate ligament (ACL) deficient knees. The ALL reconstruction procedure is still in an early phase of development and it is too soon to know if this procedure will be widely disseminated or not. The goal of this consensus article is to update the orthopaedic community with the latest scientific knowledge on the ALL including: the history, anatomy, biomechanics, clinical diagnosis, classification of acute lesions, imaging, surgical indications, surgical techniques, post-operative protocol and clinical outcomes, based on recent publications and on the opinion of the ALL Expert Group. Interest in the anatomy and function of secondary restraints of the anterior cruciate ligament (ACL) has recently piqued among knee surgeons and researchers, as it is postulated that these structures/restraints play a very important role in both rotatory instability and the pivot-shift phenomenon in the ACL-deficient knee. Recently, Claes et al. identified the ALL in an anatomic study as a distinct structure of the lateral compartment of the knee. This report, though heralded as the first clear identification of the ALL, is however preceded with reports of similar observations in the literature. Historically, the first observations of the ALL can be accredited to the French anatomist Paul Segond. In 1897 he reported on a “pearly fibrous resistant band” showing extreme amounts of tension under excessive internal rotation, eventually resulting in an avulsion fracture as a result of a severe rotational stress . Later examination revealed the “Segond fracture” to be an indirect sign of an ACL tear [22, 105]. It wasn’t until almost a century later that the ALL was once again described. In 1976 Hughston et al. described the “middle third of the lateral capsular ligament” as “technically strong”, and as a “major lateral static support at around 30° of flexion”, attaching proximally to the lateral epicondyle of the femur and distally at the tibial joint margin . Tears of this structure resulted in an anterolateral rotatory instability, which could be revealed by a “jerk test”. Subsequently, in 1982, Müller  reported on the anatomy of the “anterolateral femorotibial ligament” as a distal, posterior portion of the iliotibial tract extending from the linea aspera of the femur to the Gerdy’s tubercle. He described this ligament as providing passive rotational stabilization of the knee. Müller also described injury to this structure in the context of an acute ACL tear and suggested that the structure could undergo surgical repair. Later, in 1988, Feagin  confirmed the findings of Hughston and Müller. He identified that the ALL is responsible for the avulsion of the tibial plateau in ACL tears, providing the anatomical explanation for the Segond fracture first observed a century previously. Following this, in 1993, Terry et al. . reported on the capsulo-osseus layer of the iliotibial tract acting as an anterolateral ligament of the knee, and described its role together with the ACL as an inverted U (horseshoe) structure around the posterior aspect of the lateral femoral condyle. Aside from these main discoveries, there are a number of other authors who should also be credited for describing the ALL and for additionally postulating its importance in supporting the ACL to control rotational stability, including Irvine et al. , Puddu et al. , Campos et al. , Viera et al. , and Vincent et al. . Despite these historical reports of the ALL, the most accurate anatomical description of the ALL has been provided by Claes et al. , and its importance with regard to knee stability has been confirmed in numerous biomechanical studies [42, 53, 66, 71]. Further to the anatomical study of the ALL by Claes et al. . the anatomical characteristics of the ALL have been investigated by numerous authors [19, 23, 32, 50, 102]. In order to accurately identify the ALL, the dissection technique described by Dagget can be used . Thus far, the ALL has been consistently identified in nearly all specimens investigated [15, 19, 23, 32, 50, 102]. The various descriptions of the ALL have led to some debate regarding the exact specifications of the ligament; however, there is a consensus that the ALL is a triangular, anterolateral structure found deep to the iliotibial band (ITB). According to Daggett , the ALL can be identified on cadaveric dissection (Fig. 1) by first carefully reflecting the ITB until its insertion at Gerdy’s tubercle. The biceps femoris is then reflected and the posterior and anterior margins of the ALL are identified with and internal rotational torque placed upon the tibia . Key to successful identification of the ALL includes cautious dissection and separation of the ITB from the deeper structures, isolation of the biceps femoris, and combined flexion and rotation of the knee to identify the fibres of the ligament . Analysis of the anatomy of the ALL in numerous specimens has revealed a certain amount of variability of the structure. The femoral origin of the ALL appears to vary [9, 15, 19, 23, 32, 50, 102] but is typically found just posterior and proximal to the lateral epicondyle . The femoral origin directly adheres to the bone and has a mean diameter of 11.85 mm . The ALL runs distally, immediately overlapping the proximal portion of the lateral collateral ligament . As it approaches the joint line, some fibres of the ligament are attached to the lateral meniscus [31, 32] and the anterolateral capsule;  however, the majority of the fibres continue to run distally in a fan-like fashion, with the distal insertion being at the proximal tibia just behind Gerdy’s tubercle. The tibial attachment is 11.7 mm wide  and is centred 21.6 mm posterior to Gerdy’s tubercle , and 4–10 mm from the joint line [9, 15, 23, 32, 102]. The length of the ALL is between 34 mm  and 59 mm  from its femoral attachment to distal insertion. The thickness of the ALL also varies, and is particular in that it is nearly twice the thickness in males compared with females . At a point just superior to the lateral meniscus at the level of the joint line, the thickness has been measured as 2.09 mm in males and 1.09 mm in females . the ALL has a constant attachment to the lateral meniscus. In order to optimise eventual treatment procedures, the radiographic anatomy of the ALL and its relationship with surrounding structures becomes a point of interest. With knowledge of the radiographic landmarks, fluoroscopy is known to effectively assist in graft positioning [41, 77]. For instance, this technique has been shown to be a successful method for tunnel positioning in contemporary MPFL reconstructions  and lateral collateral ligament reconstructions . Accurate identification of the radiographic landmarks allows not only for minimally invasive reconstruction surgery, but also for a reconstruction which closely mimics the patient’s natural anatomy [41, 77]. With regard to the ALL, there are four published studies that focus on its radiographic landmarks [28, 33, 42, 72]. These studies reveal differences in the femoral landmark and similarities in the tibial landmark. On a lateral view, Helito et al. . used Blumensaat’s line as a reference point and identified the femoral attachment at approximately half way (47%) along Blumensaat’s line from the anterior edge of the femoral condyle . Kennedy et al. used superimposed reference lines to establish femoral quadrants . The first line was a parallel extension of the posterior femoral cortex. The second line was drawn perpendicularly to the posterior cortex extension and intersecting the most posterior aspect of Blumensaat’s line. The femoral attachment was identified in the postero-inferior quadrant, 8.4 mm proximal and posterior to the lateral epicondyle centre. Rezansoff et al. . described the ALL origin as being along the posterior femoral cortical line, positioned between Blumensaat’s line and a line taken from the posterior condylar articular edge parallel to Blumensaat’s line. Heckmann et al. located the ALL origin at a distance of around 37% from the posterior edge of the femoral condyle, measured along Blumensaat’s line . Anatomic variation in the ALL femoral attachment has been previously described by Daggett et al. and Helito et al. [19, 30]. To a certain degree, the variability in the identification of the femoral attachment may be due to differences in the dissection technique used. If the ALL origin is considered to be proximal and posterior to the lateral epicondyle, then it is possible that the radiographic landmark found by Kennedy et al. is accurate . If the ALL origin is considered to be closer to the centre of the lateral epicondyle, then the landmark found by Helito et al. can be considered accurate . On a lateral view, the tibial landmark was found slightly posterior to the centre of the tibial plateau width by Helito et al. and Kennedy et al. [32, 42] and slightly anterior to the centre of the tibial plateau width by Heckmann et al. . However, Rezansoff et al. , described the tibial attachment as more posterior to the location identified by the other authors (Fig. 2). On a frontal view, all authors identified the femoral landmark between 15.8 mm and 22.3 mm from the proximal joint line and the tibial attachment around 7 mm below the lateral tibial plateau [28, 33, 42, 72]. Femoral origin: on the lateral view, the femoral attachment is located in the postero-inferior quadrant described by Kennedy et al. . On the frontal view, the femoral attachment is located 15 20 mm above the joint line. Tibial insertion: on the lateral view, the tibial attachment is located close to the centre of the proximal tibial plateau. On the frontal view, the tibial attachment is located approximately 7 mm below the tibial joint line. The ALL has been placed under the scientific microscope to closely examine its associated biomechanics which range from native structural properties to native and reconstructed kinematics. These studies focus in on the ALL, while not losing sight of surrounding lateral structures and the ACL. The reason for this close examination stems from the common goal of utilising an ALL reconstruction in the setting of an ACL deficiency, which thereby may eliminate residual rotational knee laxity and reduce the risk of ACL graft rupture in select patients. 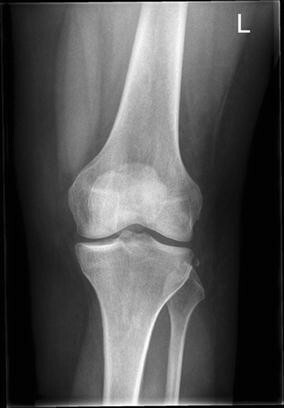 These patients may include ACL revision cases, the clinical presentation of joint hyperlaxity, and those with either high-demand for pivoting sports and/or presenting with a high grade pivot-shift diagnosis. Due to all of these recent studies, a consensus is now defined on what the ALL is and what role it plays in overall lateral knee stability. Furthermore, this information has provided the foundation to build effective and reproducible ALL reconstructions in combination with the treatment of a torn ACL. Structural property tensile testing of the isolated ALL utilising similar specimen setup and crosshead speed (20 mm/min) has produced mean ultimate load values of 189 Newtons (N) and stiffness of 31 N/mm, when averaging the values of all 29 unpaired specimens [33, 46]. This structural data provides the rationale to select the appropriate autografts in conjunction with adequate fixation methods for reconstruction of the ALL. In vitro robotic assessments of the ALL in the setting of an ACL injury have defined the ALL as a significant lateral knee stabiliser . Specifically, the ALL has been demonstrated to act as a secondary stabiliser during internal rotation torque and simulated pivot-shift test in the ACL-deficient state. These results were further confirmed by other investigators utilising a surgical navigation system . Within the discussion of these two papers, it became clear that a reconstruction of the ALL in conjunction with a torn ACL should be met with critical data, as the significant biomechanical importance lends itself to the need for sufficient and reproducible surgical techniques. Key points in this surgical treatment would involve techniques that provide stability without overconstraint while maintaining a minimally invasive, yet reproducible, surgical approach for this secondary stabiliser. This was scientifically tested in part two of the in vitro robotic assessment with special attention to a combined reconstruction of the ALL and ACL . In this study, the ALL reconstruction was able to further reduce the knee laxity when tested in conjunction with an ACL reconstruction. A primary finding was that during a simulated pivot-shift test, a significant reduction in internal rotation at 30°, 45° and 60° of knee flexion was noted for the ACL reconstruction in conjunction with an ALL reconstruction. This was statistically significant when compared to the ACL reconstruction with deficient ALL testing state. Favourable isometry is seen at the proximal and posterior to epicondyle femoral position, with the ALL being tight in extension and in internal rotation at 20° and lax at flexion at 120° and internal rotation at 90° . These characteristics are of clinical importance, enabling optimisation of the femoral location in an ALL reconstruction. Function: the ALL acts as a restraint for internal rotation of the tibia and affects the pivot-shift in the ACL-deficient knee. Diagnosing ALL lesions can be challenging even for expert clinicians. To date, no clinical tests have been validated for the diagnosis of ALL injuries. An appropriate diagnosis can only be obtained with a detailed anamnesis describing the mechanism of trauma, a meticulous clinical examination and appropriate evaluation of the radiographic and MRI imaging. Generally, a combined ACL-ALL lesion occurs with trauma mechanisms similar to an isolated ACL injury. Contact and non-contact injuries involving early flexion, dynamic valgus and internal rotation, which occur during sport, are frequently reported [20, 88]. Considering that in severe cases an ALL injury is considered to represent a Segond fracture [14, 42], it is clear that symptoms related to a Segond fracture may be present during the acute phase of injury. Symptoms include elicited pain on palpation of the lateral tibial profile, increased laxity in varus stress, and during the Drawer test with the foot in external rotation; during varus stress elevation of the anterolateral capsule due to detachment from the tibia can be observed. 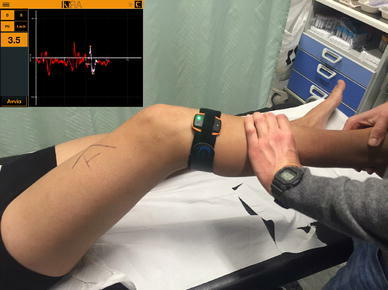 On examination, the lateral compartment of the knee should be carefully evaluated. Any swelling with tenderness over the lateral aspect of the knee, particularly if proximal to the head of the fibula but distal to the lateral joint line, should be assessed. Furthermore, the integrity of the medial collateral, lateral collateral and posterior cruciate ligaments should be examined. If patient compliance allows for a safe and effective evaluation of ACL and ALL integrity, antero-posterior and rotatory laxity tests can be performed in the acute phase. However, evaluation is more effective in the later subacute and chronic phases, after swelling and pain has subsided. Anterior drawer and Lachman tests are usually positive, with either a soft endpoint or no endpoint due to the ACL injury. The biomechanical properties of the ALL allow for internal rotation to be increased to over 30° of flexion; [71, 87] however, the pivot-shift seems to represent the most reliable test to evaluate ALL integrity. Monaco et al. demonstrated that a grade III pivot shift is only seen in the absence of both the ACL and ALL in vitro . This finding is supported by several other recent biomechanical studies [71, 87], which reported increased coupled internal rotation, and lateral tibia anterior displacement after ALL sectioning in ACL-deficient models. In the clinical setting, anterolateral capsule abnormalities are reported on MRI imaging in 20, 40 and 73% of patients with grade I, grade II and grade III pivot-shift, respectively . Great attention to the status of the ALL should thus be given in the evaluation of rotatory laxity in the ACL-deficient knee. Furthermore, as the pivot-shift has been reported to be influenced by high inter-examiner variability, standardisation of the test is recommended. Despite this, care should be taken to consider the potential confounding factors of a high-grade pivot-shift, such as a deficient lateral meniscus or root tear [59, 80], lateral posterior tibial slope >10.6° , ITB injury, or general hyperlaxity . The consensus of the ALL Expert Group is that the pivot-shift test should be executed as follows: . Step 1 The examiner should control the patient’s slightly abducted leg with the ipsilateral hand placed at the heel level, imparting an internal rotation. Step 2 The contralateral hand should be placed on the lateral side of the joint with the thumb positioned just below the level of the proximal tibia-fibula joint. Gentle valgus stress should be applied. The knee should be naturally flexed with the combined stress of internal rotation and valgus stress. Step 3 Knee flexion should be advanced with both hands. Internal rotation and valgus stress should be maintained until approximately 20° of knee flexion (Fig. 3). At the point of shifting, the rotational stress of the ipsilateral hand should be released, and the proximal tibia should be guided into external rotation by the contralateral hand. Therefore, at the time of shifting, the lateral side of the proximal tibia will suddenly drop by gravity and the tension of the ITB. The examiner should record the pathological motion elicited in the test as: grade 0—normal, grade I—glide pivot, grade II—a jerk with subluxation or clunk, and grade III—significant clunk with locking (impingement of the posterolateral tibial plateau against the femoral condyle). 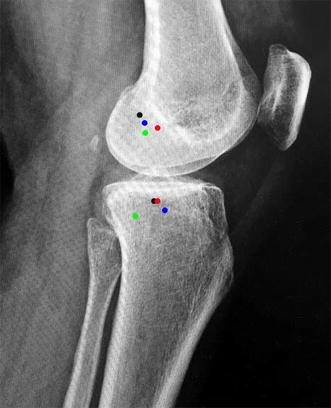 For this purpose, objective methods for quantitative evaluation of rotatory laxity, such as accelerometers [3, 106], image analysis, or electromagnetic devices  would contribute to a more accurate diagnosis of ALL injury, and could represent the future direction of clinical diagnosis of ALL injuries. The clinical diagnosis of an ALL injury can be supported by radiographic imaging. Multiple imaging modalities have been reported to provide additional information on a possible injury of the ALL. Firstly, as previously described, a Segond fracture represents a bony injury of the tibial ALL insertion  (Fig. 4). A Segond fracture refers to avulsion of a cortical fragment of the tibia, posterior and proximal to Gerdy’s tubercle. A Segond fracture can be caused by high ALL tension forces, and is often the result of internal rotation of the knee and possibly varus stress [7, 9, 14, 42]. Such fractures can be visualised on straight, anteroposterior radiographs of the knee. Secondly, the ALL can be visualised on routine, coronal MRI scans using T2-weighted sequences and proton density fat-suppressed evaluation. If the ALL is divided into a femoral, meniscal and tibial portion, it is the tibial attachment of the ALL which is most consistently seen on MRI scans [34, 92]. Two studies have shown that, on MRI scans, ALL abnormalities are frequently located in the distal part of the ligament, although some controversy still exists [13, 35, 98]. Despite this, ALL tears are difficult to consistently diagnose on standard 1.5T MRI sequences, and special sequences may be needed . On MRI, one indication of ALL injury is the presence of bone marrow oedema as a result of a recent and violent pivot-shift trauma; in the acute post-traumatic phase, bone marrow oedema can be seen in the lateral femoral condyle and bilaterally on the posterior tibial plateau . With the growing knowledge about the ALL, radiologists are becoming more used to its evaluation and protocols for evaluation are emerging . Thirdly, ultrasound imaging can be of additional value in directly diagnosing ALL injury. Again, the tibial (distal) portion of the ligament is visualised better than the femoral portion , with the meniscal portion being difficult to identify. Since most ALL tears appear in the distal part, ultrasound may be a useful diagnostic tool to visualize ALL lesions [8, 65]. The intact ALL may therefore be identified using MRI or ultrasound techniques. However, reliable imaging evaluation of the injured ALL requires further research and collaboration with radiologists to develop more refined MRI protocols to aid in the detection of the ALL. Only then can imaging be reliably used in clinical examination and to support decisions for ALL treatment. Persisting rotatory instability, indicated by a positive pivot shift, may be present in up to 25% of cases after an isolated intra-articular ACL reconstruction procedure; furthermore, persisting rotational instability has been shown to be a risk factor for recurrent injuries [10, 48]. Specific populations have a greater risk of persistent pivot shift and/or subsequent ipsilateral ACL tears. Improving the control of the rotational stability is mandatory for these patients. Female paediatric patients;  active patients who return to their preinjury level of activity ; elite athletes [67, 70] show a high rate of re-rupture and contralateral tears. Return to some specific activities including pivoting (e.g. skiing or volleyball) or contact sports (e.g. football or rugby) is also known to be a risk factor for ipsilateral and contralateral ACL rupture [1, 6, 70]. It is therefore important that the goals of a combined ACL and ALL reconstruction are to reduce the ACL graft re-rupture rate, and improve control of the rotational stability of the knee. Any surgical indication is based on a favourable risk–benefit balance. Specific complications associated with more invasive additional extra-articular reconstruction have been reported [2, 54, 75]; although the principle might be the same, the proposed modern minimally invasive ALL reconstruction techniques differ significantly from these extra-articular reconstructions. The increasing knowledge about the ALL anatomy and function has allowed definition of the basis of this minimally invasive reconstruction, with an isometric positioning of the tunnels and a specific focus in the position of the fixation of the graft. A recent study evaluating minimally invasive ACL and ALL reconstructions demonstrated good short-term subjective and objective results without specific complications . Two secondary criteria for increased risk of secondary ACL rupture or postoperative residual positive pivot shift including history, clinical or imaging signs, or patient profile. In order to support the diagnosis of ALL lesions, and aid in the decision to undertake surgical reconstruction, it is important to classify ALL lesions. Until now, the majority of studies on the ALL have focussed on anatomy  and biomechanics . A recent study by Ferretti et al. . investigated the prevalence and patterns of injuries of the lateral compartment in 60 patients with apparently isolated acute ACL tears, as diagnosed by clinical examination and confirmed by MRI. To evaluate potential concomitant ALL lesions, the lateral compartment was surgically exposed, the injuries were identified and subsequently recorded, photographed and repaired. Macroscopic tears of the lateral capsule were clearly identified in 90% of patients (54 patients). Type I Multilevel rupture in which individual layers are torn at different levels with macroscopic haemorrhage involving the ALL and extending to the anterolateral capsule only (19/60 patients, 31.6%). Type II Multilevel rupture in which individual layers are torn at different levels with macroscopic haemorrhage extending from the ALL and anterolateral capsule to the posterolateral corner (16/60 patients, 26.7%). Type III Complete transverse tear involving ALL near its insertion into the lateral tibial plateau. (13/60 patients, 21.7%) (Fig. 6). Type IV Bony avulsion (a Segond fracture) (6/60 patients, 10%). This study shows that injuries of the anterolateral secondary restraints often occur in cases of apparently isolated ACL tears. Moreover, they often involve a larger area of the lateral capsule extending beyond the ALL, known as the anterolateral complex. This study supports the previously described concept that rotational instability is a more complicated issue than simply the result of an ACL tear. Historically, the location of injuries resulting in anterolateral rotational instability and their classification started in 1976, when Hughston et al. . categorised three distinct portions of the lateral capsule-ligamentous tissues. Based on the evaluation of six patients undergoing surgery for acute anterolateral rotatory instability, the “mid-third lateral capsular ligament” was suggested to have an important role in anterolateral instability. Following this study, Norwood et al. documented the presence of injuries of the lateral compartment in 36 knees with acute anterolateral rotatory instability, in which only three Segond fractures were diagnosed. Müller  later identified the anterolateral femorotibial ligament, which, in association with an ACL tear, was shown to exhibit visible avulsion from the femur or overstretching of the fibres. Later, Terry et al. classified injuries of the lateral compartment in the presence of an ACL tear in a series of 82 cases of acute ACL injuries. In this study, 93% of injuries of the lateral compartment included transverse and interstitial superficial and deep layer tears. As injuries of secondary restraints often occur in cases of acute ACL tears, recognition and repair of such lesions should be considered in order to improve the control of rotational stability provided by ACL reconstruction. The ALL consensus group propose a surgical technique allowing for a minimally invasive and low morbidity procedure to recreate the ALL, which is crucial to anterolateral rotatory instability. The consensus opinion is to use a tendon graft with one limb attached to the femur at the correct anatomical position, and a single or double bundle (i.e. the so-called “delta”—or Y-construct) configuration at the tibia mimicking the native anatomy of the ALL. The ALL can be reconstructed in isolation, or more commonly in conjunction with an ACL reconstruction. The preferred graft is the gracilis tendon. This is harvested in the standard way and both ends are whipstitched with a number 2 suture. The knee is flexed to 90° and held with a footrest and side support. The anatomy is identified and marked. The 3 key landmarks are the lateral epicondyle, the fibula head and Gerdy’s tubercle. The femoral epicondyle is palpated and identified, preferentially before ACL femoral socket drilling. A 15 mm incision is made just proximal to the epicondyle and the ITB is divided. The lateral epicondyle is then palpated and a position taken 8 mm proximal and 4 mm posterior to the lateral epicondyle. A 2.4 mm drill pin is then inserted. On the tibia the key anatomical landmarks are the centre of the fibula head and the centre of Gerdy’s tubercle. A stab incision is made 10 mm below the joint line, halfway between the centre of Gerdy’s tubercle and the fibula head, and a dissection is made to the bone. If a second tibial socket is planned, a second, more anterior incision is made over the centre of Gerdy’s tubercle using the delta-technique. A 2.4 mm wire is then placed through each incision in a tangential fashion to the tibial bone. A 4.5 mm cannulated drill bit is then used to create two bony sockets on the tibia. To ensure that the ALL graft will not tighten in flexion and will be functioning near extension, an isometry assessment is made. The passing suture is placed around the femoral wire and then in turn around each of the tibial wires, and the knee is taken through a full range of motion. The suture should be tighter in extension and become lax as the knee is taken into flexion. If the suture tightens in flexion, then the femoral socket position is too distal and anterior and should be adjusted accordingly. A 4.5 mm cannulated drill is used to create a socket to a depth of 20 mm to fully accommodate the bone anchor. The mouth of the tunnel is debrided and cleared to ensure easy passage of the graft. The gracilis graft is then placed into the femoral socket and the screw is advanced in the standard way. Blunt dissection is carried out under the ITB to make a communication between the femoral socket and the tibial socket(s). Final tensioning is then carried out. The knee is taken into full extension, which ensures the foot is in neutral rotation, and the graft is fixed in the tibial tunnel(s) with a 4.5 mm anchor (Fig. 7). The knee is then cycled through a full range of motion several times and a final check is made of the delta graft to ensure appropriate tension has been obtained. Local anaesthetic is infiltrated and the wounds are closed in layers. The aim of ALL reconstruction is to reproduce the natural anatomy, which can be achieved through correct graft placement and fixation enabling efficient extra-articular reconstruction [45, 88]. This minimizes possible post-operative complications such as lateral constraint, loss of motion and graft failure [45, 58]. It is the recommendation of the ALL Consensus Group that rehabilitation after an ALL reconstruction, particularly if performed in conjunction with an ACL reconstruction, should be carried out in a similar way to conventional ACL rehabilitation . An accelerated rehabilitation program can be offered . This should comprise initial quadriceps awakening with both voluntary and electro stimulated muscle contraction, and emphasis should be placed on achieving immediate full extension to reduce the risk of bleeding and adhesion or cyclops formation. Passive flexion and patellar mobilization, avoiding eccentric quadriceps contraction, should also be performed. The patient can be discharged on the same day or on the day after surgery, without immobilisation, and should be total weight-bearing (as tolerated) with the aid of crutches. Hamstrings stretching to prevent flexion attitude. All strengthening should be carried out without causing pain or effusion. Regaining dynamic joint stability . Sport-specific training and “return-to-play” exercises. A return to sport is not based on time alone, but also on restored muscle function, which is reflected in strength and jumping ability . Isokinetics can be used to improve strength, with different hop tests (other than the one-leg hop test for distance) being available for assessment of functional performance [56, 73, 104]. If a combined ALL and ACL reconstruction is performed with correct positioning, the course of rehabilitation should be smooth. Rehabilitation should follow the standard ACL rehabilitation protocol, described above. Clinical results are the best way to address the biomechanical controversy surrounding the anterolateral ligament. Regardless of the type of ACL graft used, most studies report a rate of residual pivot-shift of up to 15% , with the rate of graft rupture rising to 17% in a young and elite athletic population . Lateral tenodesis combined with ACL reconstruction reduces pivot-shift, but results in no significant difference in clinical outcome . To our knowledge, there has been only one study on the clinical outcomes of combined ACL and ALL reconstruction: a prospective case series with a two-year follow up (no control group) reported by Sonnery-Cottet et al. in 2015 . Eighty-three combined ACL with ALL reconstructions were performed. A semitendinosus tendon graft was used for ACL and a gracilis tendon graft for the percutaneous double-strand ALL reconstruction, in order to replicate the triangular shape of the native ALL. The ALL was secured in full extension to ensure neutral rotation of the tibia. The mean follow-up period was 32.4 months (range 24–39 months). Pre-operatively 47 patients had grade 1, 23 patients grade 2, and 19 patients grade 3 pivot-shift test results. Post-operatively 76 patients had a negative pivot-shift and 7 patients had grade 1 pivot-shift test results. Interestingly, no complications related to the surgical technique were reported and only one patient had an ACL graft rupture one year after the ACL reconstruction, whereas six patients had a contralateral ACL rupture. Given the results of combined ACL and ALL reconstruction compared to traditional ACL reconstruction in regards to re-rupture rate, return to play and rotational stability, it was concluded that the ALL has an important function concomitant to the ACL. These findings have been confirmed by the clinical experience of more than 1000 cases performed at the study location since 2011. The excellent outcome in stability and function, the simplicity of the technique (increase in operative time does not exceed 15 min), the minimal cosmetic impact resulting from the percutaneous technique, and the low failure rate has led to a dramatic expansion of surgical indications at the study centre during the last five years. In this centre, this technique is now performed in more than 70% of ACL reconstructions. The consensus of the ALL Expert Group is that this combined technique not only allows for better rotational control, which unfortunately cannot be demonstrated objectively, but serves primarily to reduce the rate of re-rupture among high risk patients defined as under 20 years of age, high level athletes of pivot-sports, and hyperlaxity patients. The authors feel that the concerns raised about a potential overconstraint of the knee are neutralised if anatomical reconstruction is performed and the graft is fixed in full extension and neutral rotation. More prospective, randomised studies are needed to confirm these findings. The causes for failure of ACL reconstruction have been suggested to be mainly due to new trauma within the first year of a return to sports, improper tunnel placement, or peripheral instability [47, 97]. The reason for the high risk of re-injury on returning to sports is poorly understood, but factors such as impaired proprioception and insufficient normalisation of knee functional stability after ACL reconstruction have been suggested . Several studies have demonstrated abnormal knee rotational stability after ACL injury, and that ACL reconstruction typically cannot recreate normal rotational stability . An anatomical ACL reconstruction using the double bundle reconstruction technique has recently been advocated to improve rotational stability. A study using robotic rotation analysis has demonstrated improved dynamic rotational stability with a double bundle reconstruction . However, another clinical study using 3D motion analysis did not find improved functional rotational stability . Unfortunately, a number of randomised studies investigating double bundle ACL reconstruction outcomes have not been able to demonstrate consistent improvement of rotational stability by reducing pivot shift . Creation of improved rotational stability with lateral extra-articular reconstruction or tenodesis is a reasonable strategy to improve knee biomechanical properties of internal tibial rotation after failed ACL reconstructions. A few studies have looked at the impact of supplemental lateral tenodesis on the outcome after ACL revision reconstruction. One multicentre study demonstrated a reduced incidence of a positive pivot shift, but overall International Knee Documentation Committee (IKDC)-evaluated knee stability did not improve as a result of lateral tenodesis in combination with ACL reconstruction . A biomechanical study using intraoperative navigation during revision ACL reconstruction demonstrated that addition of a lateral tenodesis resulted in improved tibial rotational stability at high flexion, but had no influence on sagittal stability . In patients with ACL graft failure, an ALL reconstruction or lateral tenodesis could be considered in cases of high grade pivot shift, hyperlaxity and the desire to return to rotational sport activities. The improved biomechanical control of rotation by the lateral reconstruction could protect the new ACL graft during risk activities and return to sports. So far, no clinical studies have demonstrated that ALL reconstruction can reduce failure rates after ACL revision nor improve subjective outcomes or function. Despite this, one randomized controlled study for ACL revision patients with 100 patients randomized to ACL revision with or without ALL reconstruction using allograft tendon tissue is ongoing at the time of writing (NCT02680821). Some ACL reconstructions fail due to insufficient rotational control on return to sports. In patients with objective excessive instability after ACL reconstruction, failure of a supplemental reconstruction or tenodesis of anterolateral structures, can be considered when performing ACL revision reconstruction. However, more clinical data is needed to soundly support a significant benefit of such a strategy. The ALL has been the surrounded by controversy since its recent in-depth characterisation. In 1879 Paul Segond already mentioned the presence of a ligamentous structure at the anterolateral side of the knee “showing extreme amounts of tension during forced internal rotation” . Nowadays, it is clear that the ALL is a distinct anatomical structure at the anterolateral aspect of the human knee that is present in the vast majority of the studied cadavers [5, 15, 19, 32, 51, 89]. Furthermore, emerging scientific evidence confirms Segond’s observations that the ALL indeed restrains internal rotation of the tibia, and thus affects the pivot-shift phenomenon in the ACL-injured knees [50, 53, 63, 71, 74, 93]. Although our knowledge of ALL anatomy, function, imaging and treatment is increasing, many questions still remain unanswered. Until now, just one study on the clinical outcomes of combined ACL and ALL reconstruction has been published. More studies with longer follow-up times are therefore needed to provide the compelling clinical evidence for the efficacy of concomitant ACL and ALL procedures. Currently, the precise clinical indication for these procedures is still unknown. Although it seems obvious to reconstruct the ALL in ACL-deficient knees with high-grade rotational instability, the potential for natural healing of the ALL has not been studied to date. Further delineation of the ideal patient profile, identifying those patients who could benefit from an additional ALL reconstruction, will definitely facilitate clinical decision-making. Many surgical techniques have historically been proposed in the 1970’s and 1980’s to treat the so-called “anterolateral rotatory instability (ALRI)”, most often with variations on a ITB tenodesis-type of procedure involving the ITB . Some laboratory results on various “modern” anatomic ALL reconstruction procedures may seem conflicting at first, and definitely, among the existing techniques [29, 43, 49, 83, 86], no one has been proven superior to others, but in order to compare ex vivo and in vivo outcomes of contemporary ALL reconstruction techniques, proper terminology should be used. This paper primarily sought to provide a comprehensive consensus on the anatomy of the ALL amongst other features. According to the ALL Expert Group’s analysis, the ALL primarily attaches proximal and posterior to the lateral epicondyle on the femur. Thus, we suggest that all future studies adhere to this consensus on the anatomy of the ALL and otherwise clearly provide a detailed and precise anatomic description of the studied ligament, if different anatomy was observed. Furthermore, the use of confusing terminology as “anterolateral capsule”, “anterolateral complex”, “capsule-osseous layer of the ITB”, etc. should be avoided when explicitly the ALL is investigated in order to allow data integration into the growing body of knowledge on this interesting structure. The authors want to stress that this consensus paper has just one single goal: to improve the outcome of our ACL-injured patients. As with every significant scientific progression, the more we learn from studying one subject, the more questions and issues seem to arise. This should however not be considered as a problem, but rather as a challenge. In fact, as long as the most exiting scientific ideas are tested with the highest quality in orthopaedic research, one will eventually be able to see the bigger picture in these enigmatic instability patterns of the human knee. We would like to thank Lyndsey Kostadinov BSc (Medicalwriters.com, Zürich, Switzerland) for medical writing support (funded by Arthrex). All authors are members of the ALL Experts Group and participated in the Anterolateral Ligament Experts Meeting, Lyon, France in November 2015. All authors wrote their individual sections and reviewed the final manuscript. BSC and SC acted as editors, writing both the Introduction and Discussion and editing the final manuscript. BSC: Paid consultant for Arthrex. SC: Paid consultant for Arthrex. MD: declares no competing interests. JMF: Paid consultant for Arthrex and NewClip Technics. AF: Consultant for Arthrex. CH: declares no financial competing interests. ML: declares no competing interests. EM: Consultant for Arthrex. VBCdP: declares no competing interests. MT: Paid consultant for Arthrex. AW: Paid consultant for Arthrex; receives royalties from Arthrex. SZ: Paid consultant for Smith & Nephew and DePuy; Associate Editor of KSSTA. JZ: Paid consultant for Arthrex. Due to the study design (literature review), no patient information was collected or analyzed and therefore no consent was required. Due to the study design (literature review), no ethical approval was required. Funding for manuscript development was provided by Arthrex.